Living… in New York City, where the Bonanno family is based. It might be the 1970s, but the Mafia is still strong in this part of New York. Profession… undercover FBI agent, infiltrating the Bonanno family. Until he convinced the bureau to give him a shot, "Donnie" was stuck at a boring desk job. Initially, the FBI was reluctant about going undercover, but Donnie was convinced that this was the only way to take down the Donanno family. To get into their ranks, Donnie convinced them that he was a jewel guy from California– and ever since, he's been entering the Donanno inner circle while building NYC's biggest case against organized crime. Interests… learning how to become a gangster from Lefty, the gangster who first took him in. Lefty tells him that, “A non-wiseguy never asks a wiseguy a question. A non-wiseguy don't even talk to a wiseguy unless the wiseguy talks to him first." In fact, "just keep your mouth shut and don't put business on the street.” Seems simple enough, right? But one wrong move, and Donnie and his case are both dead. Relationship Status… taking a beating from his new job. A FBI wife knows not to ask what her husband's up to, but Maggie can’t rest easy. He told her the case would only take three months, but it’s been much longer than that, and she's worried. But Donnie can't talk to her about his work: he can't lose her, not when he took the case to make her proud. Personality… devoted and ambitious. All his life, Donnie's wanted to be part of a pack, to do something great. He’s always been one step behind, but this could finally be his chance to make it big. 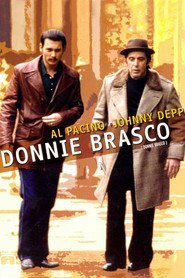 Donnie Brasco's popularity ranking on CharacTour is #3139 out of 5,000+ characters. See our top-ranked characters and read their profiles.